The Ciel is powered by a twin-turbocharged version of GM's 3.6-liter direct injection V-6 engine. PEBBLE BEACH, California -- Cadillac, hinting at a possible flagship sedan down the road, unveiled the Ciel concept, an open-air grand-touring car that recalls the Eldorado and DeVille from the past. The four-seat, all-wheel-drive Ciel -- pronounced "C-L," or French for sky -- has a longer wheelbase than a CTS sedan. As part of a plan to enhance the brand's global sales reach, GM executives have been studying a new Cadillac flagship to challenge the BMW 7 series, Audi A8 and Mercedes-Benz S class. General Motors Co. called the Ciel "a grand gesture that explores themes driving Cadillac's explorations into range-topping flagship luxury." Clay Dean, global design director for Cadillac, said at the debut here on Thursday that the architecture underpinning the Ciel is all new and that Cadillac is working on vehicles of this size. "We wouldn't be showing it if we didn't have any intentions of doing anything with it," Dean said. Dean also emphasized that design details seen on the concept -- namely its deep purple paint job and rich wood, and earthy leather interior tones -- would appear on upcoming Cadillac production vehicles. The Ciel convertible was developed at GM Design's North Hollywood design center in California. "Large, expressive luxury is innate to Cadillac and the Ciel recalls that heritage, while suggesting where the brand can go in the future," Deane said in a statement. "Authentic luxury is driven by experiences, not just products, and Ciel is about the experience of the journey." Cadillac has discontinued the DTS and STS sedans and will replace them with a single model, the front-wheel drive XTS, next year. The Ciel is powered by a twin-turbocharged version of GM's 3.6-liter direct injection V-6 engine. It is paired with a hybrid system using lithium-ion battery technology. The Ciel follows in the lineage of striking Cadillac concepts, including the Sixteen from 2003, and more recently the Provoq and Converj. 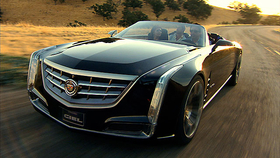 Caddy has not marketed a convertible since the Corvette-based XLR went out of production. The Ciel has a detailed interior, with Olive wood, leather and nickle-plated trim. There is a floating center console, hidden air vents and ambient lighting. The rear center console includes a small humidor that can be stocked with a few cigars. "From the materials used to create it to the space and experience it offers passengers, the Ciel represents a unique perspective on luxury, but not the only one," Dean said in the statement. "Along with other concepts, such as the ULC, Cadillac is demonstrating that the bandwidth of the Art & Science philosophy is wide, indeed -- and we're going to make it even wider." AutoWeek staff contributed to this report.